"The default Windows anti virus application used on Windows Vista and later." When you just do not have another kind of anti virus protection on your Windows PC, there is always Windows Defender. 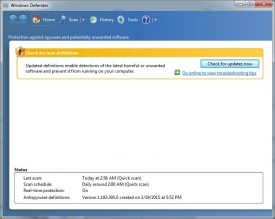 Windows Defender is installed automatically on Windows Vista, Windows 7, Windows 8, and Windows 8.1, however it is able to be removed from your computer at any time if you so choose. In this circumstance, if you were to want to download Windows Defender again as a replacement, a backup anti virus software, your main anti virus software, or just to have it installed again - you are able to do that by downloading it from here. Ever since Windows Vista, Microsoft has been going through a lot of effort to improve on the security of their operating systems. In this day in age, it is almost a necessity to have an anti virus application running in the background on your Windows PC. With the Internet becoming a very normal way to gain information, the amount of risks that you are exposed to online has significantly increased. This is why companies like Microsoft are ensuring that you have proper protection on your computer right from the start when you install your Windows operating system. While there are other options out there, Windows Defender download is always there for you when you need it. Usually, when you install third party anti virus software, Windows Defender gets disabled automatically by Windows so there are no conflicts. The main purpose of the application is to simply make sure you have anti virus software on your computer at all times, even when you personally have not installed the software yourself. This ensures that very new users to computers and/or the Windows operating system are properly protected when they, perhaps, are not knowledgeable enough to find and install new anti virus software themselves. For all Windows users, it helps deter programmers that create viruses by making sure all systems that run the Windows operating system, which continues to be the most used and successful operating system out there to date, by making sure everyone has protection. This makes it harder for those who make these malicious programs to spread the program around and effect more and more computers. Microsoft makes sure that the application receives plenty of updates to make sure it is up to date. Since it is sometimes the only anti virus software that a user has installed on their computer, it is important that Microsoft keeps up with the updates to make sure that the software will block and/or remove the worst malicious software out there and keep their computers safe, so its a perfect windows malicious software removal tool. This will also, overall, reduce the amount of effected users that these programs will cause problems to. Whether an experienced user or not, it's good to have something to fall back on when you cannot have third party protection on your computer. 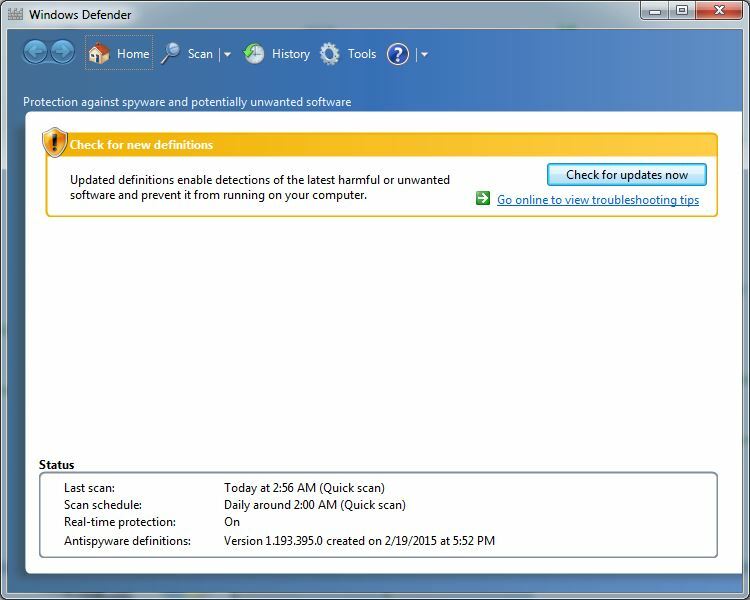 In this case, Windows Defender has you covered.